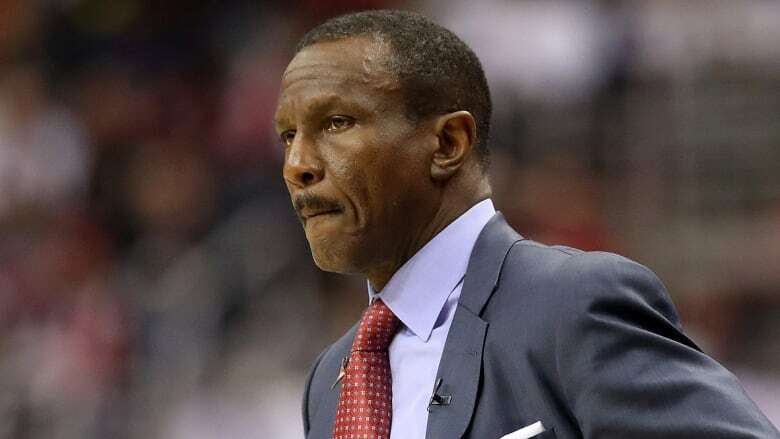 Dwane Casey, who was fired last month after the Toronto Raptors were swept by Cleveland in the second round of the post-season, has reached an agreement to become the Detroit Pistons' next head coach. Dwane Casey did not stay out of the NBA for long. A month after being fired by the Toronto Raptors, Casey was announced as the new head coach of the Detroit Pistons on Monday. According to ESPN, he signed a five-year deal with the team. Casey led Toronto to a franchise-record 59 wins this year and helped them earn the top seed in the Eastern Conference for the first time. The NBA coach of the year finalist was fired shortly after Toronto was swept by the Cleveland Cavaliers with one year remaining on a three-year, $18 million dollar extension. He was 320-238 in seven seasons and is Toronto's winningest coach. Detroit has been looking for a coach for more than month since firing Stan Van Gundy, who was also its president of basketball operations. Michigan coach John Beilein was a finalist for the job before withdrawing his name from consideration last week and San Antonio Spurs assistant Ime Udoka also was a candidate. With the Pistons, Casey has a lot of work to do. The Pistons have made the playoffs only once in nine years after advancing at least to the Eastern Conference finals six straight years, winning the 2004 NBA title and falling a victory short of repeating as champions in 2005. They do not appear to have much flexibility to make significant changes this off-season. Detroit acquired Blake Griffin in a blockbuster trade this past season and that wasn't enough to push Detroit into the playoffs. An injury to point guard Reggie Jackson derailed what looked like a promising season. If healthy, the Pistons do potentially have an intriguing nucleus with Griffin, Jackson and Andre Drummond. The Pistons are still looking to hire someone to head their basketball operation. They did bring in Ed Stefanski as a senior executive to assist in searches for a new coach and head of basketball operations. Detroit moved into a new downtown arena last season, but with the exception of some brief success after trading for Griffin, the team didn't create much buzz. Casey is getting his third shot to lead an NBA team. He coached the Minnesota Timberwolves for a little more than one season, going 53-69. He also has experience in the league as an assistant with Dallas and Seattle. Casey, who is from Morganfield, Kentucky, played for the Wildcats and helped them win the 1978 NCAA title and began his coaching career the next year as a graduate assistant under Joe B. Hall. He later back to campus to work as an assistant for Eddie Sutton. He has five years of coaching experience in Japan and has spent time around the game in Europe. Under Casey, the Raptors won four Atlantic Division titles and advanced to the playoffs in five consecutive seasons. But Toronto couldn't get past Cleveland, losing to LeBron James and the Cavs in each of the past three playoffs.